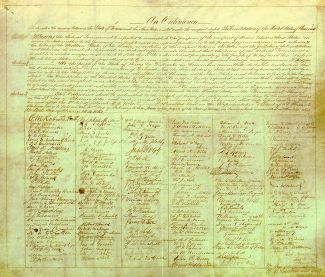 We, the People of the State of Texas, by Delegates in Convention assembled, do declare and ordain, that the Ordinance adopted by our Convention of Delegates, on the Fourth day of July, A.D. 1845, and afterwards ratified by us, under which the Republic of Texas was admitted into Union with other States and became a party to the compact styled “The Constitution of the United States of America” be, and is hereby repealed and annulled; That all the powers, which by said compact were delegated by Texas to the Federal Government, are revoked and resumed; That Texas is of right absolved from all restraints and obligations incurred by said compact, and is a separate Sovereign State, and that her citizens and people are absolved from all allegiance to the United States, or the Government thereof. This ordinance shall be submitted to the people of Texas for ratification or rejection by the qualified voters thereof, on the 23rd day of February 1861, and unless rejected by a majority of the votes cast, shall take effect and be in force on and after the 2nd day of March, A.D. 1861. Provided, that in the Representative District of El Paso, said election may be held on the 19th day of February, A.D. 1861. Adopted in Convention, at Austin City, the first day of February, A.D. 1861. The decision to secede would be affirmed by popular vote on February 23. As politicians and citizens, Baptists were on both sides of the issue. The influential Baptist minister Rufus C. Burleson, president of Baylor University (1851-1861) and pastor of First Baptist Church of Independence, had been an ally of Houston’s in seeking to prevent the secession of Texas. The duos’ efforts are not appreciated by secessionists. When in March 1861 Houston refuses to take the oath of allegiance to the Confederate States of America, he is removed from the office of governor. Also in 1861, Burleson resigns from the presidency of Baylor.